US-based Orion Labs is a team of artists, engineers, and technologists, dedicated to connecting people through seamless communication. They make it easy for you to talk instantly with friends, family or colleagues, no matter how far apart you are, without getting distracted by your phone. With Big Apple Buddy’s personal shopping service, you can now buy direct from the Orion Labs online store anytime, anywhere. 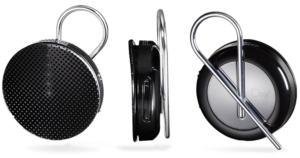 Orion Labs Onyx Smart Walkie-Talkie helps you talk more, and type less. It allows instant voice messaging with many or a few, across any distance. Talk, adjust the volume, and instantly silence Onyx without breaking your focus. There are no limits on the number of people, conversations, or channels you can have. You can use either your smartphone’s wifi or cellular data connection, so you stay connected with friends indoors and out. The Onyx is perfect for everyday work, sports, meetups and more. Unfortunately, the USA Orion Labs online store does not currently offer international shipping. However, Big Apple Buddy, your personal shopper, can help you buy products direct from the official USA Orion Labs online store and ship them to your doorstep, no matter where you are in the world. We offer international shipping to over 190 countries including Australia, Austria, Bahrain, Belgium, Bosnia & Herzegovnia, Brazil, Brunei, Canada, China, Croatia, Cyprus, Denmark, Estonia, Finland, France, Germany, Hong Kong, Hungary, India, Indonesia, Ireland, Israel, Italy, Japan, Kenya, Kuwait, Lithuania, Luxembourg, Macau, Malaysia, Maldives, Mexico, Namibia, Netherlands, New Zealand, Norway, Oman, Pakistan, Philippines, Portugal, Saudi Arabia, Scotland, Serbia, Singapore, Slovenia, South Africa, South Korea, Spain, Sri Lanka, Sweden, Switzerland, Taiwan, Tanzania, Thailand, UAE, UK and Ukraine. If you would like to buy from the USA Orion Labs online store, simply let us know which items you would like to order (by filling out the form on the right) and we’ll get back to you with a free international shipping quote within 24 hours!